'Class J enzymes are generally monomelic, whereas class ft enzymes are dimeric or teiramenc. with residues frupn two suL'ui" lis cor ilijbulifiy lo the binding sile fen a striyle 1HMA o and p refei to subunüs of the (RWA synthetases and the subscripts Indicate their slCTchiomeírv com i ta nt release of pyrophosphate. Adenylylation refers to transfer of AMP, as opposed to adenylation, which would indicate the transfer of adenine, As we have seen in the case of polynucleotide synthesis [see Chapter fi), the principal driving force for the adenylylation reaction is the subsequent hydrolysis of pyrophosphate by pyrophosphatase. As a result of adenylylation, the aminn acid is attached to adenylic actd via a high-energy ester bond in which the carbonyl group of the amino acid is joined to the phosphoryl group of AMP. 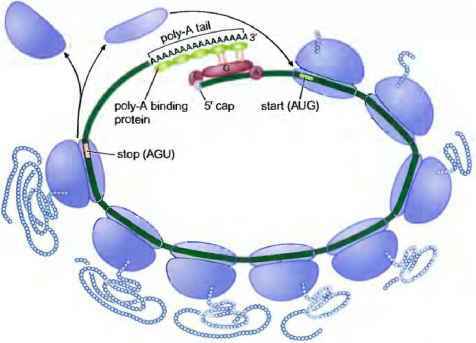 Stop two ¡s tRNA charging in which the adenylylated amino acid, which remains tightly bound to the synthetase, reacts with tRNA. This reaction results in the transfer of the amino acid to the 3' end of the tRNA via the 2'- or 3'-hydroxyl and the concomitant release of AMP. Most organisms have 20 different tRNA Synthetases, but this is not always the case. For example, some bacteria lack a synthetase for charging the tRNA for glutamine (IRNA01") with its cognate amino acid, instead, a single species of aminoacyl tRNA synthetase charges tRNAGl11 as well as tRNAL]u with glutamate. A second enzyme then converts (by animation) the glutainate moiety of the charged tRNAG,I> molecules to giutamine. That is, Clu-tRNAcln is animated to Gln-tRNAGlfl (the prefix identifies the amino acid and the superscript identifies the nature of the tRNA). The presence of this second enzyme removes the need for a giutamine tRNA synthetase. 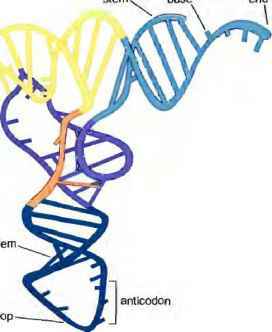 Nevertheless, an aminoacyl tRNA Synthetase can never attach more than one kind of amino acid to a given tRNA. As we can see from the ahove considerations, aminoacyl tRNA synthetases face two important challenges: they must recognize the Correct set of tRNAs for a particular amino acid, and they must charge all of these isoaccepting tRNAs with the correct amino acid. Both processes must be carried out with high fidelity. Let us first consider the specificity of tRNA recognition: what features of the tRNA molecule enable a synthetase to discriminate cognate, isoaccepting tRNAs from the tRNAs for the other 19 amino acids? Genetic, biochemical, and X-ray crystal lograp hie evidence indicate that the specificity determinants are clustered at two distant sites on the molecule: the acceptor stem and the anticodon loop (Figure 14-7). The acceptor stem is an especially important determinant for the specificity of tRNA synthetase recognition. In some cases changing a single base pair in the acceptor stem (a par ticular base pair known as the discriminator) is sufficient to convert the recognition specificity of a tRNA from one synthetase to another. Nonetheless, the anticodon loop frequently contributes to discrimination as well. The synthetase for giutamine, for example, makes numerous contacts in both the acceptor stem and across the anticodon loop, including the anticodon itself (Figure 14-8). FIGURE 14-7 Structure of tRNA: elements required for aminoacyl synthetase recognition.